Mildred Dillon, 95, of Mansfield passed away February 7, 2019 at Mansfield Place. Mildred was born September 5, 1923 in Mansfield. 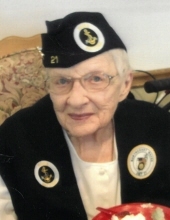 She was a 1941 graduate of St. Peter's High School and then served in the United States Navy during World War II. There she prepared the manifest to load cargo ships and served as a Yeoman Second Class. Her military service was very important to her and she continued to educate people on her service as she spoke at many engagements throughout her lifetime. She retired after 25 years at General Motors where she worked in Labor Relations and as an analyst to name a few. Mildred volunteered at St. Peter's, was a member of St. Peter's Alumni Club, GM Salaried Retirees, Unit 21 of National WAVES, and a lifetime member of the American Legion Post 16. She always enjoyed traveling, visiting Kingwood Center, was very independent and socially concerned about everything. Survivors include her sons James (Pat Burggraf) Dillon, Doug (Regina) Dillon all of Mansfield; grandchildren James (Michelle), Jeffery (Michelle), Jennifer, Melissa, Gregory, Alison (Kevin), Heather (Jared), Douglas Patrick; great-grandchildren Sara, Zachary, Alexander, Anna, Patrick, Adam, Morgan, Brooklyn, Gabriel, Emily, Laney, Dylann, Lillian, Nicholas, Jacob; niece Linda Spicer. She was preceded in death by her mother Esther Murphy; sister Marjorie; cousin Fr. Stephen Cairns; nephew Larry Spicer. Friends may call at St. Peter's Catholic Church, 54 S. Mulberry Street, on Saturday from 9-10am. A Mass of Christian Burial will be celebrated at 10:00am with Fr. Austin Ammanniti officiating. Military services will be provided following the funeral by the Richland County Joint Veteran's Burial Detail. Burial will follow in Mansfield Catholic Cemetery. In lieu of flowers, memorial contributions may be made to Catholic Charities. To send flowers or a remembrance gift to the family of Mildred Esther Dillon, please visit our Tribute Store. "Email Address" would like to share the life celebration of Mildred Esther Dillon. Click on the "link" to go to share a favorite memory or leave a condolence message for the family.